Paul Almasy criss-crosses the planet, delivering many reportages to the international press, World Health Organization, Unesco, etc. It is in fact after his arrival in France in 1938 that his photographic work begins to take off. His sociological approach, so to speak, causes him to be interested in all the different strata of the populations which he encounters, from the lowliest social classes to top leaders (e.g. portraits of Charles de Gaulle, Nehru). 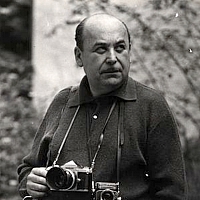 But beyond the sole desire to represent the universal values of humanity, a fundamental principle of the humanist tendency, Almasy develops a type of photography which he considers to be devoid of artifice, as close as possible to reality. A theoretician of photo-journalism, he publishes in 1980 La photo à la une, where he presents his concept of the functional and communicative image.